• Mon – Fri 8:30 a.m. – 6:30 p.m. / Sat 9 a.m. – 1 p.m.• Refill your prescriptions by calling us @ 912.489.7979. Have your medication info ready. Forest Heights Pharmacy offers a variety of popular immunizations. From the flu shot to the shingles vaccine, we can help. Our pharmacists are certified in vaccination administration. Simply call ahead for an immunization appointment, or stop by today for a walk-in flu shot. The flu is an extremely contagious respiratory illness caused by the influenza viruses. It can cause mild to severe illness, and can even result in death in high risk populations. Those who have the flu often experience fever, chills, cough, sore throat, runny nose, body aches, headaches, and fatigue. Senior citizens, young children, and those with health conditions, are considered high risk for serious flu complications. 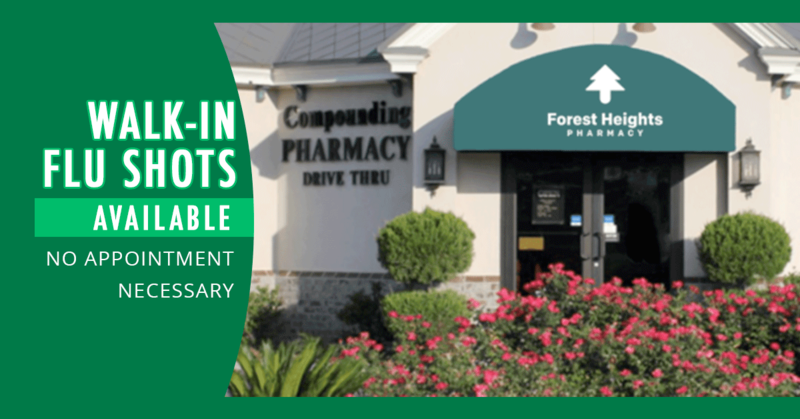 The best way to prevent the flu is by getting vaccinated each year with a “flu shot” by Forest Heights Pharmacy. The flu shot is an inactivated vaccine that’s administered through a needle, typically in the deltoid muscle of the arm. There are many different strains of the flu viruses, but every year the flu vaccine is designed to protect against the three to four main flu strains that research indicates will be the most active in the coming flu season. Usually the vaccine takes effect two weeks after it has been administered as antibodies gather to provide defense against influenza. Note that you may be vulnerable to influenza during the two weeks after your flu shot. The CDC recommends anyone ages 6 months and older to get a flu shot this season. Those with a severe allergy to chicken eggs. Those with allergies to certain medications and preservatives, including certain antibiotics and Thimerosal. Those who have had a severe reaction to an influenza vaccination in the past. Those who have had Guillain-Barré Syndrome within six weeks of getting the flu vaccine previously. Those who have a moderate or severe illness with a fever should wait until they recover before getting a flu shot. Pneumonia is a lung disease caused by streptococcus pneumoniae bacteria that can infect the upper respiratory tract and can spread to the blood, lungs, middle ear, or nervous system. Pneumonia is the leading cause of vaccine-preventable illness and death in the United States. It is the main cause of illnesses in children younger than 2 years old and adults 65 years of age or older. The elderly are especially at risk of becoming seriously ill and dying from this disease. Also, people with certain medical conditions are at increased risk for getting pneumonia. The pneumococcal polysaccharide vaccine protects against the 23 most common types of streptococcus pneumoniae bacteria and the pneumonia conjugate vaccine protects against 13 types of streptococcus pneumoniae bacteria. New recommendations state that two doses (one polysaccharide and one conjugate) of pneumonia vaccine are necessary, but under some circumstances additional doses may be needed. Who should get the Phenomena vaccine? All adults ages 65 and older who have not been previously vaccinated. Adults 19 to 64 years old who smoke or have asthma. Anyone 2 to 64 years old who has a long-term health problem. Anyone 2 to 64 years old who has a disease or condition that lowers the body’s resistance to infection. Anyone 2 to 64 years old who is taking an immunosuppressant drug or treatment that lowers the body’s resistance to infection. Who should not get the Phenomena vaccine? Those who are moderately or severely ill should wait until they recover before getting the vaccine. Pregnant women should consult with their OB/GYN before getting vaccinated. The Tdap vaccine can protect adolescents and adults against tetanus, diphtheria and pertussis. Tetanus is a dangerous nerve ailment caused by the toxin of a common bacterium often found in soil. This bacterium can also exist a wide variety of things, such as animal excrement, house dust, and operating rooms. It enters the body through puncture wounds, cuts, scratches, or wounds. Diphtheria is highly contagious and is spread by coughing and sneezing. It is a respiratory disease that typically causes a sore throat, fever, swollen glands, and weakness. It can even cause paralysis, heart failure, and death. Pertussis, also known as whooping cough, is a communicable infection of respiratory tract. Early symptoms include runny nose, nasal congestion, and sneezing. The most common symptom is excessive coughing fits. Infants are most at risk for life-threatening complications. Birth through 6 years: DTaP at 2, 3, and 6 months, again at 15-18 months, and between 4 and 6 years. Total of 5 doses. 7 through 10 years: If not fully vaccinated against pertussis, should receive a single dose of Tdap. 11 through 18 years: Tdap as a single dose preferably between 11 and 12 years. Adolescents 13-18 who missed getting Tdap at 11-12, administer at soonest opportunity. 19 years and older: Anyone who did not receive a dose of Tdap should get one as soon as possible. Pregnant Women: Should get a dose of Tdap preferably at 27 through 36 weeks gestation. Who should not get the Tdap vaccine? Those who have had an allergic reaction after a previous dose. Those who have had a coma or several seizures within 7 days after a dose of DTP or DTaP should not get Tdap. (these patients can get Td). Those who are moderately or severely ill should wait until they recover before getting the Tdap or Td vaccine. Pain and loss of muscle strength in the upper arm. Shingles is a painful skin rash triggered by the same virus that causes chickenpox. Once an individual has been infected with chickenpox, the virus remains in your body in an inactive stage. If the virus becomes active again, one may have the potential to contract shingles. Other factors that may increase a person’s chances of getting shingles are age, increased stress, and a compromised immune system. The shingles vaccine is proved to decrease the risk of shingles by 50%. The shingles vaccine can also reduce pain for those who still contract shingles after being vaccinated. A single dose of the shingles vaccine is FDA approved for adults 50 years of age and older. Those who have a moderate or severe illness. Those who are allergic to any of its ingredients. Those who are allergic to gelatin or neomycin. Those who have a weakened immune system. Those who are pregnant or plan to get pregnant. Soreness, redness, or swelling at the injection site. Monday to Friday - 8:30 a.m. - 6:30 p.m.
© 2019 Forest Heights Pharmacy & Gifts, Inc. All Rights Reserved - Website developed by UP Market Media, Inc.